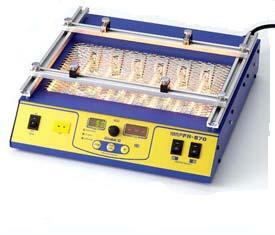 Hakko FR-870 benchtop board preheater is designed to heat printed circuit board assemblies for more effective soldering and desoldering. Particularly useful for medium to high-mass board assemblies where alternative heating methods are not an option. Select a static set temperature, a three-temperature ramp and soak or set a target temperature with the interactive thermocouple.